Nahal Amud is not just the only riverbed in Israel that runs north to south. It's also the only one that passes from the woods of the upper Galilee to the jujube savannahs of the Loser Galilee. Early in the morning, we parked the car above Safed’s military cemetery, taking advantage of the fact that a concrete staircase leads straight down from there to the city’s old cemetery. For hundreds of years, numerous tombstones have accumulated in the old cemetery. Some of them are quite dilapidated, but the tombstones of well-known people are painted either white or in eye-catching shades of blue. Among those buried here are the famous kabbalists of Safed, the most prominent among them being Ha’Ari, Rabbi Yitzhak Luria. There is nearly always someone praying beside their graves, hoping that the souls of the holy men will help the prayers reach the right ears. Opposite is the beautiful scenery of the large, green Mt. Meron. Nahal Meron, which flows into Nahal Amud, looks like a slight wrinkle in the slope of the mountain. We could clearly see the abandoned British police station on its southern bank. It was built in the time of the Arab uprisings of 1936-39 in order to protect the pumping station that brought Safed the water of the spring of Ein Yakim, which emanates from the channel of Nahal Meron. The prominent silhouette of Mt. Mitzpe Hayamim juts out from over the western bank of the riverbed. We walked down the path between the graves to the lower plaza of the cemetery, where we came upon two fig trees whose branches were adorned with plastic bags and pieces of cloth waving in the wind – a clear sign that this was a sacred place. “Life exists thanks to the prayer of those who dwell in the dust,” reads a sign at the spot, attributing the saying to the Zohar, the mystical tractate studied by many kabbalists. We checked as thoroughly as we could. There is no such passage, but it is nice that someone bothered to convey to us a bit of the spirit of Rabbi Shimon Bar Yohai, who relates his kabbalistic vision in the Zohar. The channel of Nahal Sechvi, via which we were to descend to Nahal Amud, was now very close, a bit north of the cemetery (to the right). But the new highway leading up to Safed blocked our way. We had no choice but to turn left (south) at the lower gate of the cemetery. Beside a faded yellow building, we encountered the first blue marking of the trail. Here we turned right and crossed the highway below. Afterward we made another right turn (north) and walked parallel to the highway. We passed a grove, which also had its share of graves of holy men. Further on, two lovely funeral cypress trees, whose branches grow horizontally, signaled the descent to Nahal Sechvi. The name of this riverbed (Riverbed of the Rooster) is based on its Arabic name, Wadi el-Jaj. The rooster’s haunting cry is very compatible with the kabbalistic spirit of Safed. We visited in spring, a delightful time to be in this area. Green carpets of Egyptian honesty grew among the Atlantic pistachio trees, together with tall columns of yellow asphodels and many other flowers. Amid all of this opulence, we nearly didn’t notice the old paving stones that cover a segment of the riverbed. The paving of Nahal Sechvi probably began in the fifteenth century, when Safed became a center for the production of high-quality woolen fabrics, which were exported to customers all over Europe. The expertise in this field was brought to Safed by Jews expelled from Spain and Portugal; they had first settled in Salonika and Adrianople (Edirne), where they learned the trade. What do the textiles of Safed have to do with the paving stones in Nahal Sechvi? The answer lies in the fact that in order to turn the woven wool into felt, it has to be beaten repeatedly, until the threads are very tight. This process, known as fulling, shrinks the fabric to half its size. In ancient times, a wooden club was used, or the fabric was immersed in water and trampled on – an arduous process. In the twelfth century, a mechanical fulling mill, driven by water power, was invented in Europe. Spanish Jews brought the new technology, which they called batan, to Safed. 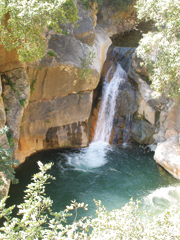 Textile merchants invested in the construction of fulling mills and it may have been they who paved Nahal Sechvi, which offered the shortest route to the Sechvi pools in Nahal Amud. The shallow Sechvi pools, which contain water all year round, create a charming little corner of the riverbed. Large plane trees are reflected in the clear water, and there are also fig trees, an abandoned flour mill, and a cave. Few hikers can resist the urge to take a little break here. We began to walk down Nahal Amud, following the black marking and the marking of the Israel Trail. Thanks to this year’s rainy winter, the riverbed was host to a rushing stream. We occasionally passed an abandoned flour mill. It can be assumed that the structures close to Safed served at some point as fulling mills. We also passed ancient arched bridges, offering further evidence of the flourishing industry. In 1576, the Ottoman authorities ordered the exile of 1,000 Safed families to Cyprus, an act that wiped out most of the city’s textile industry. Jews continued to work in the industry on a small scale until the end of the seventeenth century, and the fulling mills were subsequently converted into flour mills. Further down the riverbed, we no longer saw any mills. We were now in a purely natural setting. Interspersed with the trees of the Mediterranean wood were hedges of prickly pears and remains of olive and almond trees. A riverbank forest of huge oriental plane trees accompanied us all along the way. After about an hour and a half of walking, we saw a (blue) trail to our left leading up to the spring of Ein Koves, a half-kilometer walk. The Hebrew name Ein Koves echoes the name of Sheikh Kwayis (“the good sheikh”), whose tomb lies on the side of the trail. From Mt. Meron’s slopes to the Sea of Galilee, Nahal Amud overcomes a height differential of about 1,200 meters in the course of only 25 kilometers, and so we knew it was only a matter of time until we came to a canyon with waterfalls. And sure enough, not far from the hidden spring of Ein Seter, we saw a long, narrow canyon, in which water cascades down mightily in winter. The trail circumvents the canyon from the right and then leads back down to the riverbed. Here the trail shifts to the northern bank, but we continued in the channel for another 150 meters, in order to see the lovely curtain of water on the left side of the spring. The spring bursts out of a crack in the rock, about 20 meters above the channel of the riverbed. We returned to the trail and moved over to the eastern bank of the riverbed. We could see the water of Ein Seter flowing from the edge of a little olive orchard. The trail circumvents the continuation of the canyon from about 70 meters above it, offering a breathtaking view of green wooded slopes, the flowing canyon, and the waterfall splashing into a large pool. At the edge of the canyon, the trail returns to the riverbed, whose banks are now round shoulders instead of rugged cliffs. The woods thinned out as we descended. The plane trees were fighting an all-out war with the jujubes for control of the channel, but the increasingly warm climate and the dwindling of the water were giving the jujubes the upper hand. This segment features impressive populations of connate Alexanders (Smyrnium connatum, or morit keluta in Hebrew). It is one of the most beautiful wild plants in Israel because of the sheath at the base of each flower’s stem that broadens into a cuplike shield; this plant has even been cultivated for ornamental purposes. It grows to about a meter in height and usually springs up between piles of rocks. The Israel Trail leaves Nahal Amud for a moment and turns left on a dirt road that crosses the Parod-Amiad Highway (Road No. 85). There is a barrier against vehicular traffic, but a gate is open to pedestrians. The trail returns to Nahal Amud at its meeting point with Nahal Achbara. From here on, we walked along a dirt road used by herdsmen who graze their cattle in the area. For about 4 kilometers, the channel digs its way between erect limestone cliffs. Vultures nest on these cliffs, though a recent survey by the Birdwatching Center revealed that their numbers have diminished. The National Water Carrier crosses the riverbed here, with the network of pipes that descend from the northern cliffs and ascend the southern slope camouflaged in concrete. About 20,000 years ago, the erosion that created Nahal Amud began to accelerate, leaving several caves suspended on the cliff. In 1925, they were the scene of the first prehistoric research in the Land of Israel, when British archaeologist Francis Turville-Petre excavated there. In one of the caves, he discovered forehead bones of what became known as Galilee Man, estimated to be over 230,000 years old. We soon reached the pillar (amud) that gave the riverbed its name – a column of rock about 30 meters in height, which remained in the area after the rocks around it were swept away. were divided as to whether it was from a Neanderthal society or an “advanced” Neanderthal society. them that a Neanderthal society dwelled in Nahal Amud. There is no dispute as to the identity of the car that waited for us beside the approach road to Kibbutz Hukuk: it was definitely a Neanderthal vehicle. Nevertheless, it brought us home safe and sound, after a great day of hiking. The new portion of the trail has become very popular with the growing number of hikers who are setting out to hike the Israel Trail from North to South. At every given moment there are upward of 100 groups of hikers - from single hiker to 10 people group) who are walking along the trail. Average hiking time along the trail is 45 days. Tomer Milo, for example, celebrated her Bat Mitzvah by hiking the trail together with her father Udi. They divided the hike into two portions - from Modein to Eilat in the cooler months, from Dan to Modein in the warmer months. Tomer celebrated her Bar Mitzvah atNeot Kedumin - at the end of the second portion of her hike after 53 days of hiking. Zvika, Ohad and Maayan all aged 23, hiked the 940 kms of the trail in 41 days. The started from Eilat in April, stopped during the Sabbath in the villages along the way and finished at Kibbutz Dan. Current available statistics are that only 4 out of 10 hikers manage to complete the entire trail. Start: Parking lot of Safed’s military cemetery. End: The point where Nahal Amud meets the approach road to Kibbutz Hukuk. 1. End at Ein Koves – 8 hours. 7 hours if you start at the cemetery or 5 hours if you start at Ein Koves. Map: Trail Map for Upper Galilee (No. 2), published by the Israel Trails Committee and the Society for the Protection of Nature in Israel (Hebrew only). Warning: Make sure to bring plenty of drinking water.